While there have been UK-based cruise agency franchise operations in the past, with one of the most successful being Fred. Olsen Travel affiliated GO Cruise, the Americans are now coming to the UK. Within the past year, two large US cruise franchise operators, Cruise Holidays and Cruise One, have each announced their intention to expand into the UK market. Elsewhere, although not related, two ships owned by Carnival Corp & PLC lines had to go for emergency drydockings prior to setting out on their world cruises this year, with first the Costa Deliziosa going to Marseilles on December 18 and then P&O Cruises’ Adonia going into dry dock at Falmouth yesterday, with her sailing scheduled for this Friday. Cruise agency franchises have been big business in the US for nearly three decades now, and a similar trend has taken place more recently in the UK, as many travel agency employees feel they are now able to set up their own agency or decide to work from home as home-based agents. One of the most successful of these in the UK has been GO Cruise, which started off independently but in more recent times has been part of Fred. Olsen Travel. It now numbers in excess of fifty franchises. Others such as Travel Counsellors have tried to establish a branch called Cruise Counsellors and UK-based consortia of independent agents such as Advantage and Worldchoice have set up their own cruise clubs. Many GO Cruise, Advantage and Worldchoice members also belong to the UK industry association, the Leading Cruise Agents of the UK. Just over nine months ago, the oldest cruise franchisor in the US, Minneapolis-based Cruise Holidays, now part of the Travel Leaders Group, made the first move. In late March 2011, it signed West of England-based Global Cruising Ltd as its UK master franchise, immediately adding another thirty franchises to its network. Global Cruising’s UK franchises now use the Cruise Holidays name and receive back office support from the Cruise Holidays organization, founded in 1984, including its CruiseWeb back office software. Global Cruising is also a member of the Leading Cruise Agents of the UK. Global Cruising was launched in the UK in 2005 and took on its first franchise in 2008. Its thirty existing franchises have now transitioned to using the Cruise Holidays name and Cruise Holidays UK is seeking to expand on this base. Global ceo Martin Greenslade, who is also an active ship’s pilot, estimates that 750 UK travel agents now produce about £2 billion annually in cruise business, compared to $17 billion (about £10.5 billion) in North America. As an indication of how complicated travel organizations can become, Global Cruising operates as a trade name of The Freedom Travel Group Ltd, which is itself a back-up organization of Co-operative Travel, which recently merged with Thomas Cook, and acts as a sort of consortium. Travel Leaders Group, meanwhile, has a $14 billion turnover and includes almost 30% of US and Canadian travel agencies under its umbrella. Further North, Lancashire-based Cruise118, which was only founded in 2008, signed an agreement in mid-2010 with US-based World Travel Holdings that saw World Travel take a significant minority interest in the then £17 million UK firm. World Travel Holdings is North America’s largest supplier of cruise holidays and uses the brand Cruise411 in the US (the numbers 118 in the UK and 411 in North America are generally used for directory assistance or information). 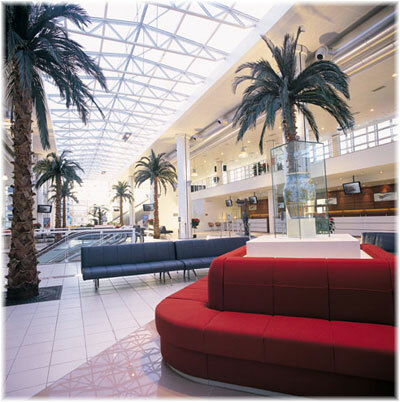 WorldTravel Holdings was founded in 2005 and is based in Woburn, Massachusetts. Its owned brands include Cruise One, Cruises Inc, Cruises Only, Cruises.com, Rooms.com, Vacation Outlet and Villas of Distinction. Last month, Cruise118 announced that it was looking for twenty more sales agents for its Chorley-based head office and that it would also be taking on over twenty franchises this year as part of the Cruise One network, the world’s largest cruise franchise, which has over 700 franchises in the US. Cruise118 estimates its 2011 turnover at about £30 million. Cruise118 directors James Cole and Mal Barritt had both previously worked for MyTravel, the company that was once known as Airtours. Cruise118 is also the official distributor of cruises sold in the UK on travelsupermarket.com and operates an upmarket cruise outlet called SixStarCruises.co.uk. It seems that the UK market can look forward to many more multiple cruise franchises within the next couple of years, with perhaps as many as 200 outlets by the end of 2012. The pre-Christmas season started out with a surprise for those booked onto the Costa Deliziosa’s December 18 cruise from Savona to Naples, Tunis and Ajaccio. Two days before the 92,720-ton ship was due to sail, passengers were called to be advised that she needed to go for an emergency drydocking at Marseilles before departing on her world cruise on December 28. The ship then offered to take her passengers on board and cater for them from the dry dock in Marseilles, where they would be given a detailed view of local sites on courtesy shore tours. Those who did not want to go were offered a full refund and a 20% reduction on a future Costa cruise. And those who were game to go on this “drydocking cruise” were offered the cruise if they wanted to proceed, plus a full refund and a 20% reduction on another Costa cruise. Surprisingly or not, 2,000 passengers decided to take the “drydocking cruise” to Marseilles. As she can carry 2,260 in lower berths this was a pretty full load. The ship entered the Chantier Naval de Marseilles dry dock on the 19th after an overnight run from Savona and left it again on the 21st, with the emergency work completed, for Savona. 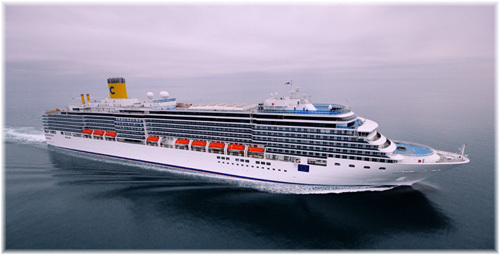 Costa Deliziosa then departed on schedule on her first world cruise, a 99-day voyage, and Costa’s first world cruise in seventeen years, on December 28, 2011, a cruise that was sold out, and will return to Savona on April 16. Meanwhile, P&O Cruises’ 30,277-ton Adonia arrived yesterday at the A&P shipyard at Falmouth for unscheduled emergency repairs before starting her own 87-day “South American Adventure” world cruise next Friday. A&P must make the necessary repairs in four days flat, as, unfortunately for the superstitious, her next departure date just happens to be Friday the 13th. This cruise is also sold out. A 10-day cruise from Naples to Southampton scheduled for last Tuesday had to be cancelled, with and all passengers given full refunds plus a 25% credit toward a future cruise. P&O would only describe the work as “essential maintenance” without providing any details, but passengers who were interviewed by one of our own clients on another ship in Salerno last week indicated that the ship’s stabilisers were not working properly and they had missed a call in Egypt because of rough weather. Another report had her flying a banner on the side of the ship in Valletta on December 31 that said “Security Warning – Keep 50 Metres Away,” but whether this had anything to do with her problem was not clear. 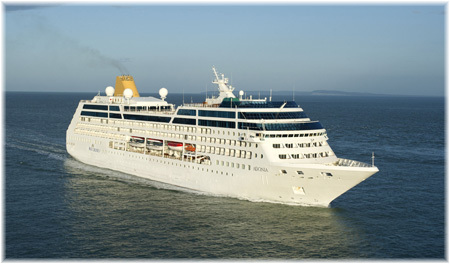 The 710-berth Adonia was built in 1990 and entered service for Renaissance Cruises as the R8, later becoming Swan Hellenic’s Minerva II and Princess Cruises’ Royal Princess before joining P&O as the Adonia in May last year.